Former Haringey children's services director Sharon Shoesmith is supporting two of Baby Peter's social workers who claim they were unfairly sacked. Peter Connelly died being abused in Haringey, north London, in 2007. Ms Shoesmith joined Gillie Christou and Maria Ward as they started an appeal against an employment tribunal ruling that they were fairly sacked. In 2010, a tribunal found the authority acted reasonably because of failings in the care they provided. Lawyers for Mrs Christou and Ms Ward are expected to make reference to a landmark Court of Appeal ruling last May that Ms Shoesmith was unfairly sacked over the tragedy. 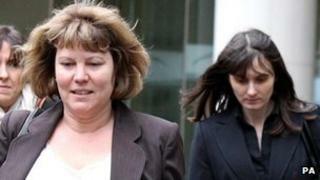 Senior judges found the council and former Children's Secretary Ed Balls acted in a way that was "procedurally unfair" when Ms Shoesmith was removed from her post and then fired without compensation in December 2008. Peter was 17 months old when he died in Tottenham, north London, in August 2007. He was found dead in a blood-splattered cot with more than 50 injuries. His mother Tracey Connelly was jailed in 2009 after admitting causing or allowing his death. Her boyfriend Steven Barker and their lodger, Jason Owens, were found guilty at the Old Bailey of the same charge. Mrs Christou and Ms Ward's legal teams have claimed they suffered "double jeopardy" because they faced two Haringey misconduct panels looking at the same allegations against them. Richard O'Dair, representing Mrs Christou, said it was "perverse" of the Watford tribunal to have found her dismissal fair given the findings of the first panel. It was a "clear error of law" of the tribunal not to have considered why Haringey council had decided to take further disciplinary action, he said. "It simply cannot be right if an employer is able in 2008 to say 'we have decided that you will have only a written warning' but two years later to turn round and say 'I know we have agreed that but we have now decided to take further proceedings'." "The facts later are the same - they are just taking a different view," he added. Ms Ward was Peter's nominated social worker at Haringey Council from February 2007 until his death, and Mrs Christou was her team manager. Image caption The Court of Appeal had ruled the sacking of Ms Shoesmith was "procedurally unfair"
The pair were sacked after an investigation which discovered there was a period in mid-2007 when they did not know where the child was. In May 2010, a General Social Care Council disciplinary committee suspended Ms Ward for two months and Mrs Christou for four months - on top of a 16-month interim suspension ahead of the hearing. They admitted failing to ensure Peter was visited regularly enough, not keeping adequate records and losing contact with him for a time. Meanwhile, two senior children's services managers sacked over the tragedy - Ms Shoesmith's deputy, Cecilia Hitchen, and head of safeguarding services Clive Preece - have also launched employment tribunal claims against Haringey Council. A preliminary hearing in their case is due to be held in Watford in April, and a full hearing could follow before the end of the year.